A unique, all-in-one solution to streamline your band’s administrative tasks. Build a public website, centralize your communications, share files and manage events and inventory — all from one integrated web app. Harmonize communication between your leaders and members with one integrated web app. All from the MyBand Web App, available on any computer, phone, or tablet. Pick the plan that fits your band. No contracts and 30 days free trial. Have more questions? Read the full FAQ list or ask us. If you’re in a band, you need MyBand. Communication is key to success. The more members you have, the harder it is to keep everyone in the loop. MyBand streamlines administrative tasks by combining your communications, music files, events and inventory management all in one centralized private network. We even give you a public website to promote your band and share your music. Yes, we’re all about “trying before buying.” Sign up and try it out for 30 days free of charge – no credit card required. If you want to continue using MyBand, you can purchase a plan after your free trial ends. Can I use MyBand on my phone or tablet? Absolutely! MyBand is a modern web app and is accessible on any computer, phone, or tablet with a modern browser. There’s nothing to download or install – just bookmark your band’s page and you’re good to go. Can other bands on the MyBand network see my content or communications? Nope, negative, no way. MyBand is a private network with robust security, which allows you to control who has access to your account. Only active members you grant permissions to have access to your private site. Can I use MyBand as a public website for my band? Yes – and this is one of the coolest things about MyBand. Your account comes with a public website in addition to the private network. Members in your private network with publishing permissions can post content to your public website to keep your fans in the loop on the latest news, upcoming events and audio or video recordings. Can I use MyBand to manage my events? Yes! With MyBand’s events management system, you can send an RSVP request to members before booking an event to make sure key people are available. With just a few clicks, you can easily view attendance summaries and detailed reports to see who has committed to your events. MyBand offers five plans that are designed to suit just about any type of band. The biggest difference between the plans is the number of members and storage. With the exception of the divisions feature in the Encore and Crescendo plans which allows for multiple bands in one account, all other features are identical between the plans. Impromptu is well suited for small bands with fewer than 10 members. Rock, pop, jazz bands and any kind of cover bands would do well on this plan. If you play in a mid-sized band of up to 35 members this is probably the right choice for you. Small marching bands, pipe bands and orchestras are well suited to this plan. The ensemble plan has all the same features of the Intermezzo plan but allows up to 65 registered members and has double the storage limit. Medium sized marching bands, large pipe bands and orchestras are suited to this plan. This plan is designed for large bands that need lots of storage, have up to 100 members and have multiple bands or sections within their organization. Medium sized marching bands, pipe band organizations with multiple grades or feeder bands, large orchestras or music schools, this plan is for you. 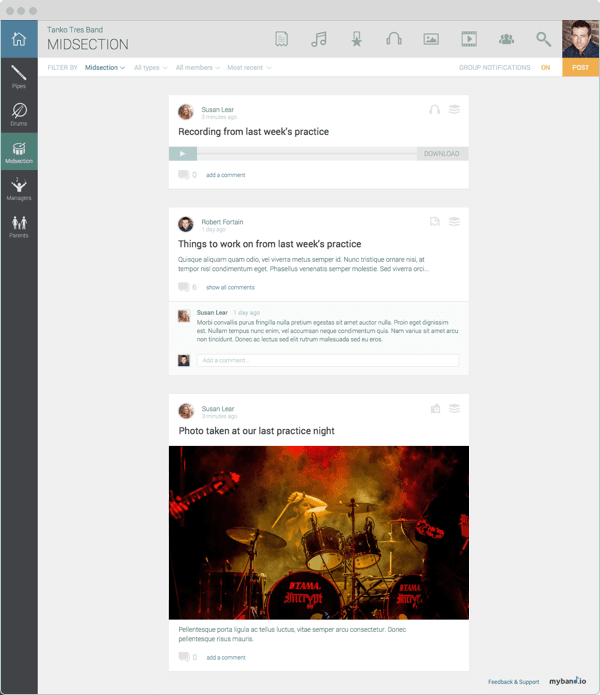 The divisions feature, unique to Encore & Crescendo, allows you to host multiple bands within one plan with the added feature of sharing content and communications across multiple bands within your organization. The Crescendo plan is identical to the Encore plan with the ability to customize the number of members and storage. Similar to Encore, the Crescendo plan is suited for large organizations with multiple bands or sections. This plan has the divisions feature which allows you to host multiple bands within one plan with the added feature of sharing content and communications across multiple bands within your organization. If you have a very large organization, marching band, drum corp, school or other unique requirements not covered in the other plans this is a good option for you. Please enquire for pricing.